Is the lattice Boltzmann method suitable to investigate numerically high-Reynolds-number magneto-hydrodynamic (MHD) flows ? 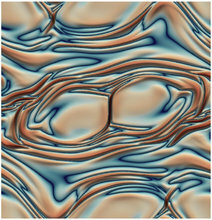 It is shown that a standard approach based on the Bhatnagar–Gross–Krook (BGK) collision operator rapidly yields unstable simulations as the Reynolds number increases. In order to circumvent this limitation, it is here suggested to address the collision procedure in the space of central moments for the fluid dynamics. Therefore, an hybrid lattice Boltzmann scheme is introduced, which couples a central-moment scheme for the velocity with a BGK scheme for the space-and-time evolution of the magnetic field. This method outperforms the standard approach in terms of stability, allowing us to simulate high-Reynolds-number MHD flows with non-unitary Prandtl number while maintaining accuracy and physical consistency.